1998 Dixi “Jig Center” Type DJC 380 TPA 100S 4-Pallet CNC Horizontal Machining Center s/n 109 w/ Fanuc Series 15-MB CNC Controls, 100-Station ATC, 50Taper Spindle, (4) 31 ½” x 31 ½” Pallets, 360 Deg Continuous Rotation, B= 0.0001 Deg., Renishaw MP-10 Probing System, Travels X=1000mm, Y=1000mm, Z=1000mm, Chip Conveyor, Coolant. 1998 Dixi “Jig Center” Type DJC 380 TPA 100S 4-Pallet CNC Horizontal Machining Center s/n 110 w/ Fanuc Series 15-MB CNC Controls, 100-Station ATC, 50Taper Spindle, (4) 31 ½” x 31 ½” Pallets, 360 Deg Continuous Rotation, B= 0.0001 Deg., Renishaw MP-10 Probing System, Travels X=1000mm, Y=1000mm, Z=1000mm, Chip Conveyor, Coolant. 1991 Heid mdl. S500-BL-3 Large Capacity CNC Turning Center s/n 0353436 w/ Siemens Sinumerik CNC Controls, Live Tooling Head, 24-Station Tool Changer, 2800 RPM, Position Capab. 360 Deg @ 1 Deg Increments, 800mm Swing Over Bed, 550mm Swing Over Cross Slide, 3100mm (122”)Carriage Travel, 450mm Cross Slide Travel, Hydraulic Tailstock, (2) Hydraulic Steady Rests with Clamping Range of 50mm to 200mm, 16” 3-Jaw Chuck, Chip Conveyor, Coolant. 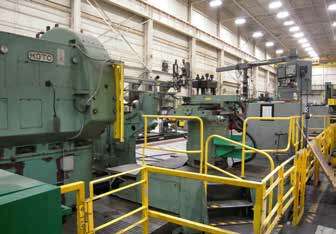 Wotan Rapid-1 4-Axis CNC Horizontal Boring Mill s/n 97025 w/ Allen Bradley CNC Controls, 60-Station ATC, 50-Taper Spindle, 8-1600 RPM, Travels X=78”, Y=63”, Z=23.6”, Column=37.7”, 44” x 55” Rotary Table with 90 Degree Indexing and 13,200 Lb. Load Cap. Voith 78” x 295” CNC Roll Grinder w/ Hotchkiss Roll Profile Generator Controls, Crowning Device, 4.25-25 Work Piece RPM, 36.000 kg Max Work Piece Weight. Spindles, 28 ½” x 118 ½” Table. Eagle mdl. EPT75 CNC Hydraulic Pipe Bender s/n 96-941 w/ Eagle Xycom Controls, 3” and 3 ½” Bending Dies. 1999 Kramatorsk mdl. K3TC 145” x 630” CNC Lathe (Retrofitted in 2004) w/ Fanuc Series 1 80i-T CNC Controls, 145” Max Swing, 102” Dia. Over Cross Slide, 630” Between Centers, 100 Variable RPM, Metric Threading 2-96mm, Inch Threading 3.3-12 TPI, 150Hp Spindle Motor, 4-Way Bed, (2) Carriages and Adjustable Tool Posts, 100 Metric Ton Max Work Weight Between Centers, 30 Metric Ton Max Work Weight W/O Tailstock, 76 ¾” 3-Jaw and 4-Jaw Chucks. 1995 Starrag La Rigide Rigid mdl. Zt-800/130 5-Axis 2-Pallet CNC Machining Center s/n 9023 w/ 5-Axis Contouring Head, Siemens CNC Controls, 192-Station ATC Tooling Capability, (112 Currently Active), CAT-50 Taper Spindle, 30-5000 RPM, Work Area X=1600mm, Y=1000mm, Z=1320mm, “A” (Head Rotation) = +60 Degrees, -100 Degrees, (160 Degrees TotalRotation), “B” Rotation Thru Pallets, 800mm x 800mm Pallets with 4000kG Max Load Weight, Knoll Coolant Filtration System.